The Central African Republic is divided into 14 administrative prefectures. There are also 2 economic prefectures and one autonomous commune. The prefectures are further divided into 71 sub-prefectures. the two economic prefectures are Nana-Grébizi and Sangha-Mbaéré. The commune is Bangui. ↑ Benn, Margaux (21 February 2016). "Newly Elected Central African Republic Leader Faces Hard Realities". New York Times. Retrieved 10 December 2016. ↑ (PDF) World Population Prospects, Table A.1. 2008 revision. United Nations. 2009. http://www.un.org/esa/population/publications/wpp2008/wpp2008_text_tables.pdf. Retrieved 2009-03-12. 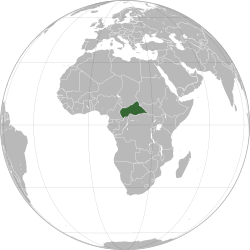 ↑ 3.0 3.1 3.2 3.3 "Central African Republic". International Monetary Fund. Retrieved 2012-04-18. ↑ "XE: Convert XOF/USD. Communauté Financière Africaine (BCEAO) Franc to United States Dollar". www.xe.com. Retrieved 2017-05-17.